Spending an an afternoon in the autumn sunshine foraging for sloes and damsons (and stopping off somewhere along the way for an obligatory forager's pint) is my idea of a perfect afternoon excursion. Normally at this time of year the damson trees are creaking under the weight of their plump purple fruits but thanks to rather rubbish weather this year they are all looking a bit bare and sorry for themselves. Fear not though because there are plenty of sloes on the blackthorn bushes and they make perfect booze buddies. If you make this now it will be ready in time for Christmas, yeah I know, I went and said the C-word but there were chocolate SNOWMEN on the shelves of my local supermarket today and that just freaked me out. 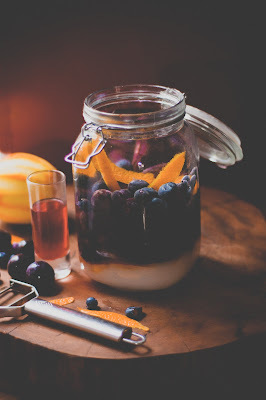 In my opinion nothing says "I love you, you raving booze hound" like homemade boozy treats, so get infusing those fruits then sit back and enjoy the oooohs and aaahs come Christmas present time. I like to use about 600g of fruit for every litre of gin so be that all damsons, all sloes or a mixture of the two is up to you (I had a few blueberries knocking about in the fridge so chucked them in as well). The gin that you use is also up to you but don't go for the really expensive stuff, save that for your martinis, likewise don't use a gin that you wouldn't want in your G&T either (ditto wine, never cook with wine that you wouldn't happily enjoy a glass of). Prick the fruits all over with a cocktail stick or pin then pop them in a big kilner jar (alternatively for the ultimate lazy version just freeze them and then defroast them, the freezing process breaks down the fruits but I kinda like sitting at the kitchen table and stabbing them all). Add the orange zest and top up with gin and seal. Keep in a cool dark cupboard (so that you retain the lovely colour of the fruits) and every few days/once a week just agitate the jar a bit to help things along. Leave for at least 3 months then have a taste. If it needs more sugar now is the time to do it before leaving it for a bit longer until the sugar dissolves. Once happy with the sweetness strain through muslin into glass bottles and put back into the dark cupboard. You can drink it now but it will get better over time and if you can manage to leave it until next Christmas then you really will be in for an amazing treat. Oooh damson and vanilla, liking your style!